Dumaguete city is the capital of Negros Oriental, the south-eastern part of Negros island in the Visayas region. Nicknamed “City of gentle people”, Dumaguete is primarily a university town, with at least one third of population being students. Besides being a key cultural center, the city is also a major gateway to countless beautiful locations in the area. We offer complete Dumaguete tour packages, which include transfers, hotels and tours. We’ll help you find the best attractions within the city and around it. Everything from one day itineraries to a grand tour of the whole region is possible, so just read below and start building your preferred package. Our Dumaguete packages include airfare, transfers, accommodation and tours of all popular attractions. These packages can all be modified to meet your specific needs. Take a look at our pre-made packages below, click on each for more details and add everything you like to your wishlist. Spend at least a day touring Dumaguete city itself, since there are many nice places to see. You can then plan your remaining time based on the type of activities and sites you wish to explore. Combining Dumaguete with other nearby locations is advisable, since the city is very close to many beautiful islands such as Siquijor, Cebu and Bohol. Let our experts plan your entire vacation, and we promise you will get a full taste of Visayas – one of the best areas in the Philippines. The city itself has a lot of cheap accommodation options, mainly to serve the large student population. Since the hotels industry here is quite developed, you can expect high standards even in most guesthouses and hostels. These are mainly found near the pier area and around Silliman university. Dumaguete city also has some proper hotels, and they are also very affordable but not really 5 star quality. For a more luxurious experience, one should head out to either Ajong beach or Dauin. Both are located 30 minutes from the city to the north and south respectively. Over there you can find a large selection of resorts, some of which are of the highest quality. Dauin is a great jumping point to diving in Apo island, while Ajong is close to Oslob where you can go whale watching. There are specialized dive resorts in each location, which will help you with tours, gear and everything else. Go through our catalog of handpicked hotel, or read a detailed review of each before making your choice. You can also just contact us and tell us what you want to do, and we’ll help you pick the right place to stay accordingly. Flights : Cebu Pacific and PAL each have two daily flights from Manila. Cebgo operates the line from Cebu, with 2 daily flights as well. Ferry : There are many ferries to Dumaguete’s main pier from Cebu, Bohol and Siquijor. Make sure to check with us first, because ferry schedule is subject to change. Taking a ferry directly from Manila doesn’t make much sense as it takes 26 hours or so. Getting around : You can only find taxis near the airport, so jeepneys and tricycles will be your safest bet when you reach the city. Resorts can help you rent a motorbike, or you can just head to one of the rentals shops in the city center. Best time to visit : Weather is fine all year, but rainy days are always possible. attractions : Diving, waterfalls, history and culture, nightlife, all inclusive resorts. Local festivals and holidays : There are a ton of local festivals and parades all year long, spread throughout the whole Negros island. Let us know at which dates you’ll be there, and we will recommend the best ones. Most notable yearly celebrations are the Sandurot festival (3rd week of November) and Bulgasan festival of Negros Oriental (middle of October). Both are held in Dumaguete city and attract a lot of visitors to the city. There are between 3 and 4 flights a day from Manila to Dumaguete, operated by Cebu Pacific. The first one is at 07:00am, and the last one alternates between 14:55 and 17:20pm. There is also one daily flight from Cebu City leaving as early as 05:55 and landing at 06:35. There are also several flights from Davao each day. Getting to Dumaguete by sea is also a good choice as there are many destinations connecting to it. First of all, there is a fast craft ferry from Cebu City to Dumaguete, leaving at 06:00, 07:00, and 03:35. The trip is between 3 hours and 15 minutes and 4 hours, depending on the shipping line. The 07:00 one leaves form pier 4, and the others from pier 1. If you happen to be at the southern end of Cebu Island, and want to continue to Dumaguete you don’t have to go all the way to the city. There are ferries from 04:30am to 19:30 leaving from Liloan Port in Santander, Cebu, to Sibulan in Negros Occidental. Sibulan is less than 7km from Dumaguete, so you’ll need to take a tricycle to the city. Two other tourist gateway destinations to Dumaguete are Bohol, and Siquijor. There are a few daily trips from both. Travel time from Bohol is 1 and a half hours at 08:00, 09:15 and 17:45 from Tagbilaran. There are 2 daily trips from Larena in Siquijor at 06:00 and 08:00, and travel time is 1 hour. Travel time from Siquijor Pier is between 30-40 minutes, 06:00 and 12:15 every day. What To Do In Dumaguete? We recommend you spend some time in Dumaguete city itself, before heading off to some of the nearby sites. We offer a short description for each of the popular tourist spots and attractions in Dumaguete, so you can get a clear sense of the possibilities that await you. All these are available as day tours, but can also be easily combined into a larger tour package. All you have to do is add any of them to your wishlist. Our agents will help build your package, based entirely on what you’d like to see and do. Rizal Boulevard at the town’s center is the place where everything is happening. A beautiful boardwalk next to the ocean, this is also where most hotels are located. The Boulevard is a perfect place to take a stroll, especially at evening. It makes a great ending point for your day tour around the city. Once you are done, stop by one of the restaurants and bars for some fun to wrap up your day. 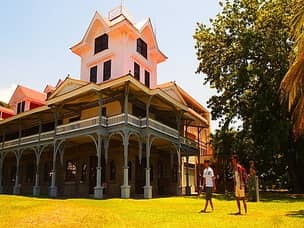 Another major attraction is the Silliman university – the town’s main educational establishment. The first American college to be founded in the Philippines (1901), it is also one of the top performing universities in the country to this very day. The institute bears special significance for being one of the few Protestant establishments in a predominantly Catholic country. The university has two entrances, the famous ‘gate of knowledge’ on its west side and the ‘gate of opportunity’ on the southeast, directly facing Rizal boulevard. The pillars on these gates have become so iconic, that they’ve been incorporated into Negros Oriental’s provincial seal. That’s a huge testament to the impact and importance this establishment has had on the province. Leave any form of valid ID at the gate, and you’ll get a visitor card in return. Once inside, stroll through the the large campus area (33 hectares) and get a sense of what it’s like to be a student in the Philippines. Most impressive is the 2km long Hibbard avenue, named after Dr. David Sutherland Hibbard – the American who founded the school. The university is also home to three museums – anthropology, natural history and marine mammals museums. If you already visited Manila’s natural history museum, consider skipping this one which is just a smaller version. The other two, however, are a must for any nature and culture lover. The anthropology museum will give a lot of insights into the local culture, while the marine museum has the 2nd largest collection of whale bones in the world. Dumaguete also has a few really nice churches and old monuments that are worth a visit. Most attractive is the main Cathedral, the St. Catherine Of Alexandria Parish. Both the exterior and the interior are quite the sight, especially at night when everything is lit up. The Maranatha Full Gospel Church on Rizal boulevard is far less impressive, but if you happen to be there on Sunday morning then it’s definitely recommended to go inside. The best beaches are Dauin and Zamboangita to the the south of the city. Dauin is the more popular, and where most beach resorts are found. Zamboangita on the other hand, is further to the south and offers a more quiet and secluded beach experience. We chose to highlight these two, mainly because they are the jumping points to Apo island tours. Most resorts will help arrange the boat trip to Apo island – a 45 minutes ride. You can also go down to Zamboangita pier however, and rent a boat yourself. Since Apo island is very small, most people choose to not stay there for the night. However, there are a few guesthouses and hostels on the island itself. Apo is famous as one of the best diving spots in the Philippines. The island is home to a stunning coral reef full of marine life, most notably the sea turtles which made diving in Apo so popular. Another extremely popular beach is the Manjuyod white sandbar, the pinnacle of every island hopping tour. The island is almost completely empty, with just a few huts and not even a single tree in sight. It’s actually possible to rent one of the huts for a night if you wish, with large cottages costing 4000 PHP and smaller ones only 3000. Manjuyod is a perfect place for relaxing, swimming and snorkeling. You can take a bus from Dumaguete to Bais and rent a boat, but we recommend incorporating Manjuyod with a day tour of Bais. You can visit the bird sanctuary, mangrove forest and go whale and dolphin watching. This island is often compared to the Maldives in terms of the sheer beauty and tranquility it offers, so we strongly recommend booking our Manjuyod island tour as part of your package. If you are feeling a bit more adventurous, take the 2 hour bus ride to Bayawan city. The beaches here are perfect, and the view is simply stunning. Best part is, you are most likely going to have the entire place all to yourself! Bayawan Beaches are also a great place for diving and snorkeling, so it’s overall a great way to pass a day, especially for families and couples. Dumaguete’s countryside isn’t all about beaches though, as there are countless other sites to visit. The Casaroro Falls for example, are a great hiking spot not far from the city. It will take you an hour to climb to where the falls are, and trekking through the jungle is a lot of fun. Once there, you can refresh yourself by swimming in the cold waters. We’d be happy to arrange this tour for you, but if you do it on your own be sure to ask the driver to wait since finding transportation back to the city is nearly impossible. If you don’t feel like climbing, you can always head off to Redrock Falls instead. This waterfall is surrounded by red rocks and that’s how it got its name – a really beautiful scenic view. There are a few man-made pools around where you can take a dip in, and also a hot spring. 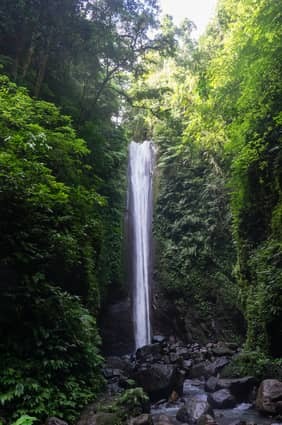 The falls are located about 30 minutes drive from Dumaguete, near the city of Valencia. Since both waterfalls are relatively close to each other, you can even do both! If you are already in the Valencia area, consider spending a night at The Forest Camp resort. This is a Eco park and large resort in the mountains, surrounded by waterfalls, lakes and other natural attractions. The weather is much cooler up there, and it can make for a nice change after so many days of beach bummin’. head up north towards San Jose and you can find the Twin lakes. Although not as impressive as some other lakes in the Philippines, this place does have its own unique charm. Once you pay the entrance fee (100P) you’ll arrive to a restaurant with a nice view of the first lake. You can also take a short walk down to the shore. Reaching the 2nd lake will require renting a kayak, and could be a nice adventure if you are up for it. How Does Dumaguete Fit Into My Travel Plans? Still unknown to most foreign tourists, Dumaguete offers a refreshing change from other cities in the Philippines. It’s a magnet for students, artists and free-thinkers – creating a unique vibe and something you can’t really experience anywhere else in the country. Combine that with beautiful nature, stunning beaches and world class diving sites and you understand why you should make Dumaguete a part of your vacation. We offer standalone tours and packages to Dumaguete, all you have to is add any item to your wishlist and let us take care of the rest. However, it’s much better to combine this trip with a few other nearby destinations and let our experts build a complete vacation package for you. Since Dumaguete is close to amazing destinations such as Cebu, Siquijor and Bohol, it’s very easy to build a plan based on your preferences and favorite activities. Hi! Planning to go to dumaguete on oct 29 for 3 nights. For arrangements for a trip to Oslo . Thanks for your inquiry, we’ll send an offer straight away. Keep in mind that even if you book a private van through us, this trip takes 2 hours – you’ll have to catch the first ferry from Liloan near Dumaguete which leaves at 4:30 AM. 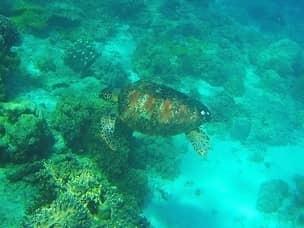 If you are into diving, another option is to spend a day at Apo island – one of the best diving spots in the Philippines and much easier to reach from Dumaguete. You can discuss everything with our agents and they’ll help you figure out the best plan. Hey Rox and thank you so much for your interest in our services, we will do everything we can to help. It’s absolutely no problem if you already have everything else booked, we can help with arranging tours and transportation if needed. You can read more about Siquijor and Apo island and see exactly what services we offer. Organizing an island hopping day tour from Dumaguete to Manjuyod which also includes dolphin watching is possible. We will email the rates for such tours as soon as possible. You made an excellent choice in going to Dumaguete, we are certain you’ll have a wonderful time there. We’ll be at Dumaguete from Feb5-9 2018. We are 2 adults and 2 kids (2 & 6 years old). Hi Diane and thank you for contacting us. One of our agents will mail you soon with a detailed offer. If you are interested, you can also read more about Oslob and Siquijor on our website. It’ll give you a better idea of the hotels and services we provide at each of these places. We hope you and your family have a wonderful time in Dumaguete, it’s an excellent choice for a short family holiday. Hi. We’ll be arriving in Dumaguete probably after lunch on Jan. 27 from Siquijor. We plan to tour the city, then we need an overnight accomodation (preferably below 1.5k). Early next day we’re interested in a day trip to Apo Island, after which we’ll go back to Cebu. There’s only 2 of us. We’d really appreciate your suggestions. Please email me your rates. Thank you! We don’t work with such budget hotels. The reason is they are already so cheap, and we can’t really offer any attractive rates to our clients. Honestly, if you are so flexible in terms of accommodation level, you can just wait until the last minute and book whatever is available on the online booking sites. I will email you our rates for the Apo Island day tour. In the meantime, you can read more about the place here. I will be traveling with my 9 year old and planning to go to Dumaguete for 2 nights from 10th April – 12th April and one thing we definitely want to do is a day trip to Apo Island. We will be coming from Siquijor so am after a quote for ferry options, accommodation under 2k and also apo island day tour price please? Hi Ana and thanks for leaving a comment. One of our agents will mail you soon with an offer based on your instructions. I assume you guys are going to dive? otherwise not much to do over at Apo Island i’m afraid. Your kid can do snorkeling, but for adults we highly recommend booking a fun dive at the very least. Could you help arrange a tour for us? We don’t know which one is possible but we want to visit below places. Hey Albie and thanks for the comment. All these tours are available, with the exception of Oslob – i encourage you to read about the environmental damage this tour causes and reconsider going there. In any case, we don’t want to be a part of that exploitative industry. We’ll mail you a price list for all the other tours later on today. Please send me quote for 1pax all-in exclusive package. We will send you an offer later today. Thank you for your interest in our services! Hi there! My husband and I are going to Dumaguete on April 27 through May 1. We have already booked our plane tickets and accommodations. Can you please send us a quotation for the manjuyod/dolphin watching tour? We are open to other tour suggestions as we will be staying for four days. I will appreciate some feedback. Thank you. Please fill out our inquiry form so we have all relevant details, then one of our agents will send you a quote. Thank you for showing an interest in our services!